Jesus, knowing that the Father had given all things into his hands, and that he had come from God and was going to God, got up from the table, took off his outer robe, and tied a towel around himself. Then he poured water into a basin and began to wash the disciples’ feet and to wipe them with the towel that was tied around him. (John 13:3-5 NRSV). Up until eight years ago, I never participated in the washing of feet during the Maundy Thursday Liturgy. Since that first time I had my feet washed and washed the feet of another person, I take part in this yearly ritual. It is a very special moment in which all of my pride takes a back seat. There is a tremendous amount of humility and vulnerability in having my feet washed and washing the feet of another person. When having my feet washed the person doing the washing gets to listen a little to my own personal story of where I have walked, what I have done and where I might be going. When I wash the feet of another person, I open myself up to listen to where the other individual has been, what they have been doing and where they might be going. Feet get dirty. Feet smell. Feet may be smooth or calloused. Yet, in that moment of washing feet there is an openness and an acceptance of God’s love for me and the opportunity to share that love with another person. Among the many things that draws me to The Rule of Saint Benedict is in Chapter 53 On the Reception of Guests, he instructs the Abbot and the entire community to wash the feet of the guests. After washing their feet they will all say together “God, we have received your mercy in the midst of your temple” (Ps. 48:10). Actually look up Psalm 48:8 in The Book of Common Prayer on page 651. St. Benedict is allowing the guests to inconvenience the Brothers. When Guests come it is their (and our) opportunity to put aside our own agendas and preferences and serve Christ crucified in the other. What a great mystery to lead us into contemplative prayer. Our loving God sees in us the goodness of Christ to give ourselves over in sacrificial love with Jesus to serve others in His stead. As we enter into this wondrous moment, God’s love penetrates the deepest part of ourselves and calls us to union with God in purity of heart. What are you willing to do today to serve the presence of Christ in another person? Care of the sick must rank above and before all else, so that they may truly be served as Christ, for he said: “I was sick and you visited me,” and “What you did for these least brothers you did for me” (The Rule of St. Benedict Chapter 36 The Sick Brothers, vv.1-3). I am writing this blog reflection after learning that a dear friend of mine is going through what I did a year ago. His mother is dying. As I read his post on Facebook, I was reminded of what I was feeling that moment when I realized that my mother was going to die. The grief and sadness that griped my heart and soul was inescapable. My mother who visited in on me when I was sick as a child, who was always at my bedside, took me to the doctors, got me medicine until I got better; she was now the one who was sick and dying. There was nothing I could do. I had to turn to hospice services to give her the end of life care she needed; and be sure I was doing some good self-care. I thank God everyday that I had the help of hospice. They were my visiting angels in the course of a terrible time in my life. All through this past year as I have worked through my grief I have been doing Lectio Divina reading Fr. Albert Holtz’s book Walking in Valleys of Darkness: A Benedictine Journey Through Troubled Times. This morning the Greek word Holtz called my attention to is episkeptamai. The word means “to visit” “to care for” in a way that is life-giving and healing. The word was important to the life of those early Christians. When they used episkeptamai for “to visit” “to care for” it meant that that God’s visit to us in our moments of grief, sorrow, sickness and death is not some mere stopping by for coffee and see you next time. When God visits us in our moments when we are isolated and hurting; God’s visit is always to “work some healing wonder in our lives” (Holtz). Even if that healing wonder does not bring back our loved ones, or give us what we most desperately want; God is there with us sharing that pain and loss with us. Sometimes God visits and cares for us in those moments to bring healing to those places in our lives that we did not even know needed the balm of God’s compassion..
Saint Benedict focuses his Monks on the responsibility for visiting and caring for the sick. He is recognizing that the Christ who visits us in our moments of sickness, grief and sorrow; is the same Christ we visit in another individual who is ill, in distress and abandoned. Visiting and caring for each other in our moments when we are so vulnerable is in and of itself a moment of deep contemplation with a wondrous opportunity to experience the Mystical Presence of God. It is a moment to see how God views us and those who are in need around us. God’s extravagant love is closer to us in those moments when we need God so desperately. Even when we or another person is questioning where God is at this moment. When God does not seem to make sense. God still sees all of us as God’s beloved with whom God is well-pleased. How is God visiting and caring for you and/or calling you to visit and care for others? “Jesus said to him, “If you wish to be perfect, go, sell your possessions, and give the money to the poor, and you will have treasure in heaven; then come, follow me.” (Matthew 19:21-22. NRSV). Saint Antony (or Anthony), is one of the great Desert Fathers. He had wealth, property and family. When he heard the words of the Gospel of Matthew quoted above, he immediately set aside all he had and entered into a very austere life of prayer and meditation. He was a great example of the word Monk as meaning “one” with God. As time has moved forward, and dispersed Monastic Communities have been begun and flourished in which the members can be married, have jobs and live in their own homes; the question comes up about how we live into the words of Jesus that moved St. Antony. Very few of us today would close up our bank accounts, divorce our spouses and put our family members into another person’s hands to be left there never to be seen again. Does that necessarily mean that we are failing to live into the words of Jesus? The answer at issue here, is not whether we have and/or make use of what God gives us. It is how much we allow these things to possess us to the point in which we separate them from our relationship with God and others around us. Most of us, including myself are glued to our phones, computers, jobs, seeking the applause of the crowds and wanting our false sense of self to feed our egos. The message of Jesus, St. Antony and St. Benedict is simplistic, just not simple. Are we willing to contemplate in silence and solitude, so that we seek union with God through all of the things God gives us to be used (not possessed by us) to serve God and others? If you are like me, knowing that in my mind and living it from the heart are not simple by any measure. Jesus, St. Antony and St. Benedict are not saying it is simple; they are saying that it is possible. It is possible to live in relationship with God and others to find the mystical presence of the Holy in ourselves, others and the things we are loaned so that God is part of everything around and about us. How are you being challenged to give up what you value to follow Jesus more closely today? If you hear his voice today, do not harden your hearts (Psalm 95:8). And again: You that have ears to hear, listen to what the Spirit says to the churches (Rev 2:7). And what does he say? Come and listen to me sons; I will teach you the fear of the Lord (Ps 34:12). Run while you have the light of life, that the darkness of death may not overtake you (John 12:35). (RB 1980: The Rule of St. Benedict in English, Prologue vs 10-13, p.16). In the Prologue to The Rule of St. Benedict there are at least twelve references to listening. The very first word in The Rule is Listen. We can almost visualize St. Benedict as the loving father and teacher who is just fed up with a class of students who are not paying attention. The teachers job is to teach, while it is the place of the student to be quiet and to listen. 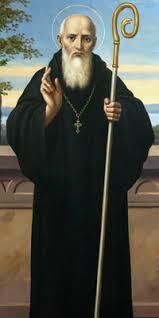 St. Benedict tells us here that God knows how very difficult it is for us to listen. Our personal lives are over run with noise. The exterior noise activates and agitates our interior noise. I have written many blog posts about listening. This post will definitely not be the last. I can come up with any number of excuses not to listen to God. I bet you can too. I can fill this post with any number of legitimate reasons not to take the time to listen to God. Yet, there are equitable benefits that we do not consider. When we take time to center ourselves on God in Lectio Divina, centering and/or contemplative prayer, we discover that God has been speaking to our hearts through life itself. The argument we just had. The letter we just received. The burden that we are carrying. God often speaks to our hearts when someone who loves us very much, tells us something that is very difficult to hear. There in those moments, God is coming to us to lovingly walk with us from our place of hardness of heart to a moment of conversion that affects every aspect of our lives. There we discover God’s compassion and love with infinite possibilities. We can accept and let go of ourselves into God’s care, with the humility to trust in God for where God will lead us next. Today, if we hear God’s voice, may we not harden our hearts. May we listen by inclining the ears of our heart, as God meets us and leads us now and in the future.